The benefits of imaging without using ionizing radiation, when feasible, are clear, but radiation is not the only potential danger in the imaging environment. As with most choices, there is some kind of tradeoff. Still, I was a little surprised to learn that MRI-related accidents are growing at a rate five times faster than the growth in MRI exams. That's what MRI safety expert and medical architect Tobias Gilk told writer Kathy Hardy for her story on MRI safety certification on page 20. He added that "MRI has the distinction of being a modality where the more we know about it the worse we are doing as an industry in preventing injuries." Gilk's statement is understandably an attention-grabber, but the thought that we know how to prevent MRI accidents—certainly, the vast majority—yet their growth is eye-catching. The challenge isn't solving the problem of what to do or what not to due in the MR environment, it's training more people in such a way that they have that information and apply it all the time, which is the mission of the American Board of Magnetic Resonance Safety (ABMRS). "We certify the hardware, the software, and the site itself, but no one, until now, has certified the most important part of the process—the operators," says Emanuel Kanal, MD, FACR, FISMRM, AANG, director of magnetic resonance service at the University of Pittsburgh Medical Center. Kanal also chairs the ABMRS. If MRI had a Jedi Council, he'd probably be a member. Launched earlier this year, the ABMRS has received a strong response to its nonprofit education and accreditation efforts. Three testing dates currently are scheduled for 2016. For more information, visit www.abmrs.org. 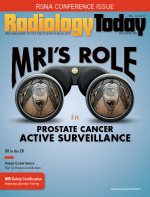 Also featured in this issue is an article looking at MRI's potentially changing role in diagnosing and treating men with prostate cancer—or holding off treatment. Multiparametric MRI and 3T scanners are helping radiologists better assess lesions and inform decisions about when to treat and when to hold off exposing men to the potential complications commonly seen in prostate treatment. RSNA was born when X-ray was the modality. Here we are 100 years later and radiologists routinely interpret a host of imaging modalities—including some, such as MRI and ultrasound, that don't use the X-rays that started it all. Happy 100th anniversary, RSNA.